Everyone's favorite bombastic Korean music video, PSY's "Gangnam Style," has set another world record: It's the first music video to have been watched 2 billion times. 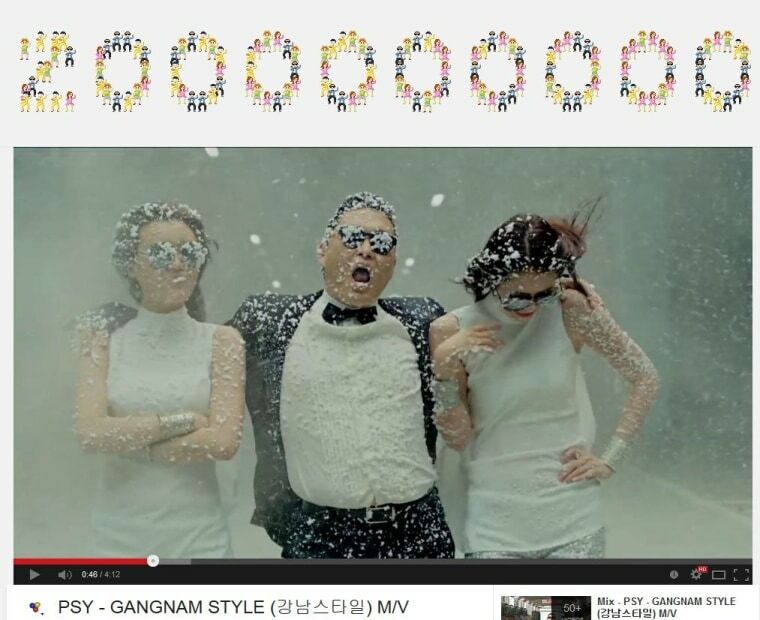 YouTube celebrated with a "2,000,000,000" figure made up of animated versions of PSY and his backup dancers. Oppa YouTube style! This ridiculous statistic comes straight from YouTube's metrics, which track every video's performance day by day and year by year. "Gangnam Style," which was uploaded just under two years ago, has been racking up a million or more views a day — even after its initial popularity (when it was doing 15 million a day) died down. In a distant second is Justin Bieber, whose "Baby" (featuring Ludacris) has garnered just over a billion views over its four years online. Bieber's other videos routinely rack up hundreds of millions, so he's probably not too sad about claiming second place. It's certainly a big change from the early days of MTV, or from record sales, where a million viewers or records is a massive standout success. PSY's follow-up videos haven't achieved quite the same levels of global obsession ("Gentleman" is almost at 700 million), but it would be surprising if he didn't have something up his sleeve for this landmark moment.